A recent ChangeWave Streaming TV survey of 1,450 North American respondents shows further momentum for original content - both as a reason to pay for streaming TV and viewership across the major platforms. 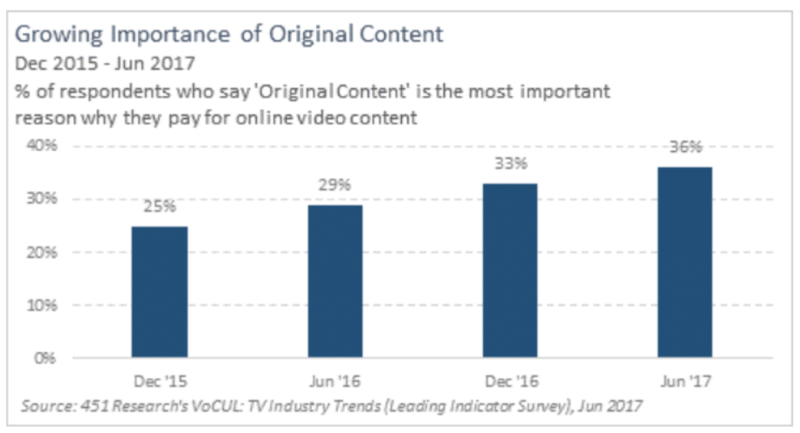 Original content (36%) is gaining momentum among consumers as a key reason to pay for streaming video - up three points since December 2016 and seven points year-over-year. Original content is even more of a priority for 'streaming enthusiasts' (i.e., respondents who pay for three or more streaming services). Among this group, original content (48%) is showing momentum as the primary driver behind their decision to subscribe, up 14 points year-over-year. Looking at individual streaming services, 42% of Netflix subscribers cite original content as the reason they pay for online video - an eight-point increase year-over-year. Among Amazon subscribers (38%; up nine points), that growth has been even stronger. The findings on viewership also fall in line, as original programming is now the most watched type of content among Netflix subscribers (37%; up seven points year-over-year). Netflix's increased investments in developing original content looks to be paying off, at least among its existing subscribers. Amazon, which is said to be spending an estimated $4.5 billion on original content this year, is also seeing a meaningful impact on the viewing habits of its subscribers. 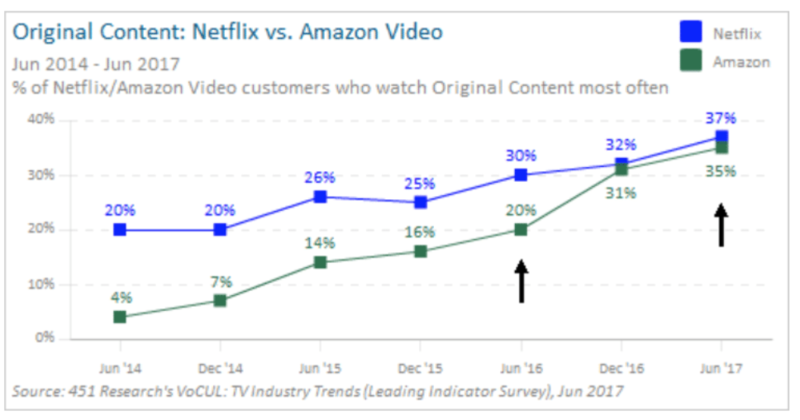 Better than a third (35%) of Amazon Video users now say they're watching original content most often - up 15 points from June 2016. A surprising storyline here is Hulu, which has traditionally been an outlet for 'catch-up' TV. Despite Hulu's relatively smaller original content library, 35% of its subscribers now say original content is the most important reason why they pay - up 14 points from June 2016. "This is certainly a mixed bag for content providers. The results point to a clear path: 'make the best original content and reap the rewards.' But being able to differentiate from competitors based on availability and quality of original content is also an expensive strategy. Netflix, for instance, has said it will spend $6 billion on original programming in 2017. Those are decidedly different economics than simply being a content aggregator and makes the path forward for such players a challenging one." A Closer Look at Netflix vs. Amazon vs. Hulu. We also asked Netflix, Amazon, and Hulu subscribers to rate satisfaction with specific aspects of their streaming subscriptions. Netflix (51% Very Satisfied) shows an advantage over Amazon (37%) and Hulu (28%) in satisfaction for quality of original content. But Amazon Video's rating is up seven points year-over-year compared to a three-point increase for Netflix. How satisfied are you with each of the following aspects of your Netflix/Amazon/Hulu subscription? In streaming video quality, Netflix (50%) and Amazon (47%) are neck-and-neck, while Hulu (38%) lags. Nearly all Amazon Video users are Prime subscribers, and thus the higher satisfaction reflects additional benefits received by members, including two-day shipping. The results show that survey respondents subscribing to Amazon Video ($8.34/month) pay an estimated $1.51 less than Netflix ($9.85/month) and $1.25 less than Hulu ($9.59) subscribers. Originally published on 451 Research.